Fyvie Castle dates back to the 13th century when it was built by William the Lion as a royal stronghold, and it remained under royal ownership until the late 14th century, at which point it passed into several generations of noble Scots families; first Preston, then Meldrum, Seton, Gordon and finally Leith. Today the fortress is owned and maintained by the National Trust for Scotland and it has to be on the top of the list of historical attractions to visit in Aberdeenshire. Within the rooms of the 800-year old castle are some of the finest collections of antiquities, armour, portraits and furniture that you’re likely to find in any castle in Scotland, and you’re free to wander around the rooms either as part of a guided tour or by yourself. This place drips with history in every corridor, gallery and staircase, and the guided tours are definitely worth taking as you’ll learn surprising facts about Fyvie that you might otherwise miss. For instance; the castle’s guests have included Robert the Bruce and Charles I, there’s a skeleton entombed within the walls of one of the bedrooms, and there’s a secret room somewhere in the castle that legend says must never be opened. In fact, there’s an entire history of ghostly goings-on at Fyvie Castle which led to the TV series ‘Most Haunted’ presenting a show dedicated it, so if you’re a fan of spooky tales you might enjoy hearing a few from the expert guides as they take you on a tour. Moving through the rooms of the portrait collections you’ll find works by Raeburn, Romney, Gainsborough and many others, as well as lots of interesting additions to the castle including an ice house, a bird hide and a glass-roofed racquet court. There’s even a loch in the outside gardens with its own resident collection of wildfowl, and your visit can be rounded off with a visit to the Victorian kitchen tea room. Delgatie Castle has been standing on this site near Turriff since the late 16-century, but it’s known that a fortification of some kind has existed there since at least the 11th-century. A fine example of a Scottish keep, Delgatie Castle consists of the main keep building, an adjoining house and two wings that are offset from the main building. Although the castle was initially owned by the Earl of Buchan, after the Battle of Bannockburn it was given to Clan Hay where it remained their family home until passing into the care and ownership of the Delgatie Castle Trust. Inside you will find some of the finest painted ceilings in Scotland, a bedchamber visited by Mary Queen of Scots, various collections of paintings, and the widest turnpike stair in Britain. Externally there is a large area of pasture land where horses roam freely, and there are cottages that are available for guests to rent as well as a river that is a very popular trout fishing site. One of the main draws to Delgatie is the Yester Room which serves fantastic traditional afternoon teas on vintage china and tableware (the food there won the Scottish Baking Award in 2015 and 2016), and the gift shop which sells a variety of gifts in the Clan Hay tartan. Kinnaird Head Castle and Lighthouse is one of the most unusual fortifications in the entire British Isles. Originally built by Sir Alexander Fraser in the late 16th-century, it served as a family home until 1787 at which point it passed into the ownership of the Trustees of the Northern Lights, who converted it into Kinnaird Head Lighthouse. 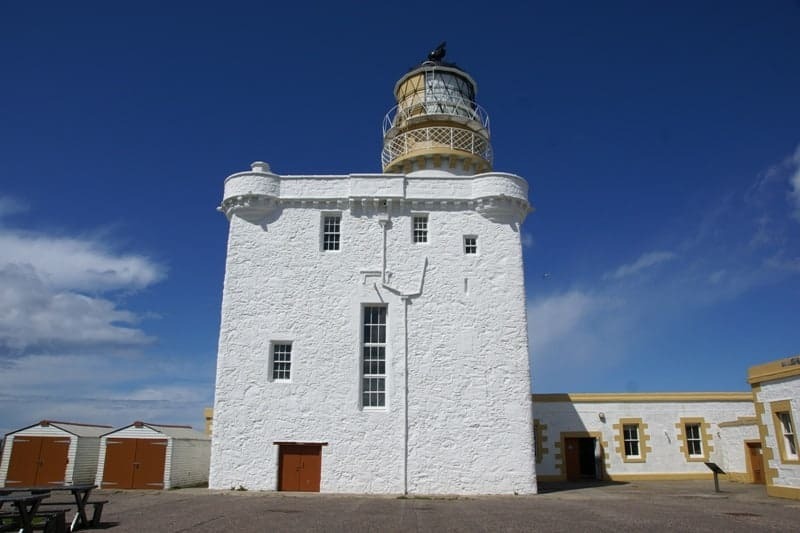 Although no longer used as a lighthouse (a smaller unmanned beacon now takes that role), Kinnaird Head Castle retains many of the original lighthouse features and have been preserved just the same as the day when the last lighthouse officer walked out of its doors. The location is perfect for taking photographs of the rugged Aberdeenshire coastline and there are plenty of interesting things to discover there, such as the nearby three-storey stone tower that was used as a storehouse but has legends of hauntings from the Fraser family member that leapt to her death on the rocks below. It’s quite incredible to find a working lighthouse tower built inside a castle, and thankfully the entire site has been carefully maintained by the Kinnaird Head Trust. The attraction is formed into two parts, with the castle and lighthouse combined in one section and the nearby Museum of Scottish Lighthouses in another. The lighthouse features a climb up a spiral staircase which leads out to some amazing views across the north sea, while the museum exhibits some interesting displays of lighthouse artefacts that have kept ships clear from the rocky Scottish coastline for hundreds of years, including the largest lens collection in Britain. You can also check out my Aberdeenshire Castle itinerary tour days one and two.